Everything from Star Wars: The Last Jedi thus far has heavily focused on the dynamic of Rey and Kylo Ren, and rightfully so. They are the characters we see this new trilogy through. But there’s one character whose been hiding in the shadows from the moment we heard his name, Supreme Leader Snoke. Snoke is one of the most mysterious characters we’ve ever had in Star Wars. There’s no doubt that he’s the man behind everything regarding the First Order, and more specifically the turn of Kylo Ren, formerly known as Ben Solo. But is The Last Jedi going to piece together the puzzle that is Supreme Leader Snoke? Only time will tell, but luckily for us, it seems that the film will do at least one thing and bring the character on screen in the flesh rather than in full holographic form as he was in The Force Awakens. Empire Magazine just released a bundle of glorious covers for The Last Jedi, and inside those covers holds a brand new image of Snoke. It’s by far the best look we have at the character yet, giving us a detailed look at the structural damage his face has taken. We’ve heard that Snoke stands close to 8 feet tall, but could he still be human? Maybe the new image leans one way or another. Darker than Palpatine? Could it be? If so, Snoke may be the most psychotic character we’ve ever gotten in Star Wars. From small hints in The Force Awakens and outside canon, we know the kind of strings he’s pulled to get where he’s at and be aligned with those he is, but could those things be worse than anything the Emperor did? It’s hard to believe, but quite honestly, it’s almost believable because of one thing: writer/director Rian Johnson. He has something planned for us that we’ve never seen in these movies before, and a large part of that could be Snoke. This makes sense. We know that Kylo Ren isn’t a Sith, so why would Snoke be? Where the universe is now, there are no more Sith. Hell, there aren’t anymore Jedi. The old ways are gone and something new is forming, manifesting, and it’s incredibly dark when it comes to the side Snoke lies on. What are your thoughts on the comments? 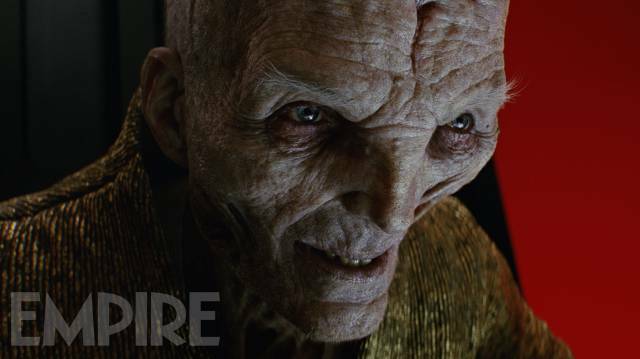 Could Snoke be the darkest character we’ve ever seen? How powerful do you think he is? Who do you think he is? Johnson’s Star Wars: The Last Jedi hits a theater near you on December 15th.